What is that sound ? Imagine that a tube very long and full of air is closed at one end by a mobile piston P (fig. 1). Move the piston around its equilibrium by a position reciprocating motion that it will successively take positions p1, p2, p1, p2, etc. The fluid, even in this case, be adversely affected in the vicinity of the piston for a continuous series of pressures and depressions. At a determined point in the fluid pressure is sometimes higher, sometimes lower than the atmospheric pressure, these following changes over time, the rhythm oscillations of the piston. Rather than consider what is happening at a specific point of the fluid, follow a particle of it. It runs hedge and part of its position movements of balance, this still at the rate of movement of the piston. We describe a word what happens in the tube by saying that an elastic wave propagates. For certain rates of movements of the piston the human ear will be sensitive to the elastic wave thus generated: This is a sound. The description given here is a little summary. Indeed we know fluid molecules are moving fast movements and disordered that are the thermal agitation. The sound wave superimposed a motion to this thermal agitation, and it is because this movement is ordered it becomes us noticeable, though, often, the amplitude of movements due to the sound wave is less than that due to thermal agitation. When a sound propagates in a medium, particles of the latter range from hand and of their equilibrium position without movement of the whole of the material there. The motion of a particle around its equilibrium position is represented on the curve I de la figure. 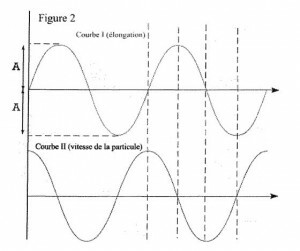 2. the value maximum elongation is the amplitude A of the elastic wave, and the curve is a sine wave. Frequency expressed in Hertz, a hertz, noted Hz, being one cycle per second. It finally is convenient to introduce the pulsation, represented by the Greek letter ω and is equal to the product of the frequency by 2π. Instead of strive to follow the evolution of a particle over time, wecan worry about how the different regions of space will be interested by the vibratory movement. In the experiment described in paragraph 1, these are first of all elements in contact with the piston which are set in motion. Reaction elastic particles communicate their vibratory movement to neighboring regions. To the end of a time t the disturbance reached all molecules between plans P and Q. Let flow a new time interval t the wave reached the R -plane and we find that: PQ = QR = D.
This is to avoid confusing particle velocity and velocity that this last was replaced by Celerity. c is the speed of sound, ω the pulse and the amplitude of the wave. In particular, note that the power varies as the square of the frequency. Examples include only one 75 musicians playing fortissimo makes peak power 70 W; a piano playing fortissimo represents only 0.4 W, whereas a clarinet emits only 0.05 W and a violin playing pianissimo only 4 millionths of a watt! This is compared to the reactions of the human ear that sounds were first classified. Two main characters are involved: the intensity and height. By intensity on means the energy put into play by the sound. In this respect it is worth mentioning the great sensitivity of the human ear since its audibility threshold lies to a thousandth of a billionth of erg. The height of a sound is defined by its frequency. If the sound is “acute” its frequency is high, if the sound is ‘serious’ its frequency is low. From very many experiments were performed to determine the domain of audibility of man. A large number of scholars include Félix Savart, Francis Galton and Rodolphe Koenig. This last note, for example, that at the age of 41 he heard sounds acute 23,000 periods, once aged 67 years while he could no longer perceive sounds beyond 18 432 periods. This illustrates well the fact that the range of audibility depends upon from the individual and his age. Yet should specify for each pitch he is a minimum value of intensity below which nothing is more perceived by ear. Similarly it is possible to determine for each audible frequency intensity limit above which appears the sensation of pain. We accepting, on average, that Audible sounds have their frequency between 16 and 16000 Hz. Share and another of This audible field we have, the low frequency infrasound and frequencies high ultrasound, and then the hypersons. It is to these latter two categories that our report is devoted. But previously, give some information about infrasound. Frequencies below 16 per second, infrasound arise, for example, during the opening and closing of doors and windows, or when it suddenly moves an object in the air. In the examples above the pressure oscillations are low. But it sometimes occurs with infrasound of slow evolution and great intensity. This was the case on 25 August 1883, during the eruption of the Krakatoa volcano, in the Sunda Islands. An infrasound circumnavigated the Earth in both directions, causing in Paris one variation in atmospheric pressure of 2 mm Hg. Sounds whose frequency is greater than the limit of audible sounds arecalled ultrasound. As we shall see in the next chapter, ultrasound were long characterized by frequencies from tens of thousands of times per second. Physical research led to methods of producing ultrasound of 100 million and more times per second. Although no limit specified has been set, some authors speak of hypersons and it seems the frequency of those -ci will exceed never about 10 trillion (1013 Hz). Remember that bats, dolphins and porpoises emit and detect ultrasound frequency of the order of 150,000, either in the form of continuous waves, in the form of short pulses. It is so that little bats emit short and powerful cries whose frequencies are spread from 30 to 120 kHz. About the dolphin, it can transmit and receive either short pulses (a thousandth of a second), or 150 kHz ultrasonic continuous waves. Our pollsters most Advanced are less efficient than “sonar” of the dauphin ! Note that these velocities are small compared to the thermal agitation speeds of molecules, except when it comes to large molecules of colloidal suspensions, which explains the action of ultrasound on these suspensions. In this presentation, will address the basic phenomena that now allow to issue or approve ultrasonic waves. Whistle through which the air is tablet was the first mode of production of ultrasonic; but even in him bringing some improvements, ultrasound obtained using this method were not satisfactory. After have exhausted the possibilities of production of ultrasound using mechanical phenomena simple, engineers looked at the beginning of the 20th century on the use of electrical phenomena. When a single spark bursts, means a brief snap; it happened locally a sudden rise in temperature, the air expands and an elastic wave is spread. Renewing the spark a large number of times per second will be a sound high frequency. In order to achieve frequencies higher than those obtained using the whistle, it will then look at building a device that could transform the electric oscillations in elastic oscillations. Today, the method most commonly used to generate and detect Ultrasound uses the phenomenon of “piezo-electricity” described later. Nevertheless, apart from organic production methods (dolphins, bats), there are other methods for generating waves ultrasonic… One of them uses the effects of electromagnetism, it comes from the transmitter to magnetostriction. A quartz blade subjected to pressure or traction electrically polarized, and conversely, a quartz blade subjected to an electric field expands or contracts the direction of the field. One is thus able to generate and detect fluctuations in size of a Blade (suitably chosen) extracted from a quartz crystal. But if the quartz was the first material used for the transmission and reception of ultrasonic, waves of other bodies are also called piezo. These include sodium tartrate and hydrated potassium (or “Seignette salt”) or synthetic bodies as the monosphate , ammonium DIPOTASSIUM tartrate or still the ethylene diamine tartrate. The quality of an ultrasonic device depends on the sequence of the phases and their optimization. 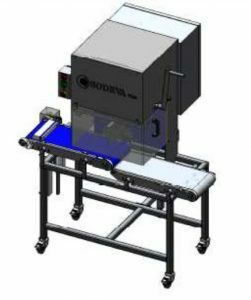 Sodeva has thus optimized its own vibratory field in specific applications dedicated to vibration in blades titanium elastic metal which allows a popular cut on food products. For screening the famous movement of the gold washer was amplified up to 35,000 (micro) movements per second! A little better than arms to flow! We study and develop innovative systems in the areas of filtration, cleaning of heat exchangers and homogenization of liquids. Each application has its specific components for further performance. Home » What is an ultrasound ?